There is a foundational reason for why I don’t accept symbol replacement. We simply do not have the authority to change what God commands in Scripture. As his people, our responsibility is to accept what He commands and put it into practice, not modernize or update it. I’ve already covered this point in-depth here and shown how this hermeneutic actually undermines other biblical symbols (like Baptism and the Lord’s Supper). 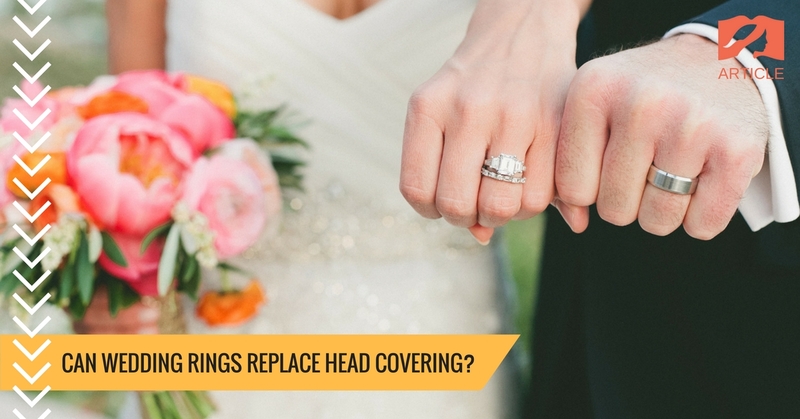 For this article, I’d like to narrow my focus on the “wedding ring” and share why I do not believe it is a suitable replacement for head covering. I’ll lay out my case through five reasons. Wedding rings were practiced in the first century too. Wedding rings are not a modern invention, they were practiced in first century Greco-Roman culture as well. For example, the Christian author Tertullian around the year 200 A.D. mentions how the previous generation “made such provisions for modesty and temperance; when a woman was to wear no more gold about her than the wedding-ring upon her finger” 2) Tertullian: The Apology, translated by Wm. Reeve, (1709 reprinted 1889). Tertullian.org. Retrieved 24 March 2017, from http://www.tertullian.org/articles/reeve_apology.htm . Dr. Judith Sebesta in her book “The World of Roman Costume” says, “It had also become customary for married women to wear a gold ring before the second century.” 3) Sebesta, J., & Bonfante, L. (2001). The world of Roman costume (1st ed., p. 78). Madison, Wis.: University of Wisconsin Press. 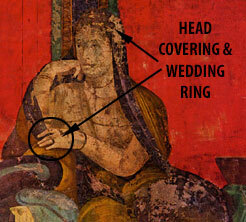 Finally, Dr. Karen Hersch in her book “The Roman Wedding: Ritual and Meaning in Antiquity” says, “Roman rings from every century—importantly, many from the century in which Pliny [1st century] was writing — were ornamented by gems carved with clasped hands which were routinely identified by art historians as symbols of marriage or engagement.” 4) Hersch, K. (2010). The Roman wedding (1st ed., p. 41). Cambridge: Cambridge University Press. So both literary and archaeological evidence show that wedding rings were used in the first century. Since head covering was commanded by Paul in the midst of a culture that used and understood wedding rings already, it is not a suitable replacement. Wedding rings are not gender specific. In our culture, wedding rings are worn by both men and women. However, Paul doesn’t just instruct women to wear coverings, but also for men to do the opposite. The Scriptures state “Every man who prays or prophesies with his head covered dishonors his head” (1 Cor 11:4). So if “wedding rings” were to replace head covering in 1 Cor 11, the man would be forbidden from wearing a ring. This deepens the case for why rings fail to be a good replacement. God has in mind a symbol for both genders and for men, it’s the opposite of what the woman does. Wedding rings are not Christian or Complementarian. A head covering symbolizes the truth of headship which is that a woman’s authority is man (1 Cor 11:3) and that she was created for the man (1 Cor 11:9). 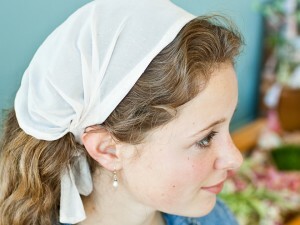 So head covering is an affirmation of creation-order truths–a joyful acceptance of Biblical womanhood. Wedding rings in our culture do not carry this meaning. They are worn by everyone from Atheists to Feminists to unfaithful men and women. A ring has no deeper meaning than you are married in our culture. It does not indicate you are faithful to your spouse, or that you joyfully accept God’s role and purpose in gender or marriage. It’s also notable that the symbol God gave us to visually communicate headship is a symbol on one’s head. A finger-symbol fails to communication headship like a head-symbol does. Wedding rings do not “cover” the glory of man. The reason why a man cannot cover his head is because “he is the image and glory of God” whereas woman must be covered since she is “the glory of man” (1 Cor 11:7). In addition to being a symbol of biblical manhood and womanhood, it is not by accident that the symbol God gave us is a “covering”, for its purpose is to symbolically “cover” glory. When we worship, the glory of God cannot be veiled (which is why men cannot cover their head) and the glory of man must be veiled (which is why women must cover their heads). 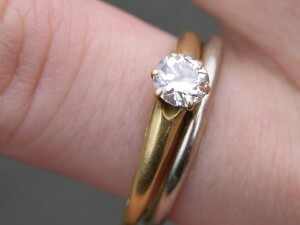 A wedding ring does not cover anything and so it fails to fulfill one of the purposes for the symbol. Head covering is not a marriage symbol. There is nothing in the context of 1 Corinthians 11 that indicates marriage is in view. The creation order of men and women are discussed with no reference to the marriage relationship. Those who advocate the view that head covering was what a faithful wife in the first century wore to show that she was married fail to take into account that most portrait busts we’ve found from that time period show respectable married women unveiled. Lots more has been said on this point which we’ve covered here. Since head covering was not a symbol of marriage, replacing it with a wedding ring would communicate a different message than God intended in 1 Cor 11. We’re to symbolize biblical manhood and womanhood and have only the glory of God unveiled. Because of these five reasons, I strongly believe that a wedding ring is not a suitable replacement for head covering. 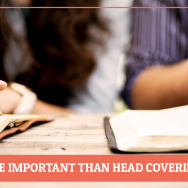 God has given us a head-symbol to communicate head-ship and a covering to cover human glory. That is a powerful visual picture that cannot be improved upon, and which should be re-introduced (not replaced) in our churches. ↑ Sebesta, J., & Bonfante, L. (2001). The world of Roman costume (1st ed., p. 78). Madison, Wis.: University of Wisconsin Press. ↑ Hersch, K. (2010). The Roman wedding (1st ed., p. 41). Cambridge: Cambridge University Press. Well researched and well argued! Thanks! Preach it brother! The idea of a wedding ring instead of head covering is absolutely ridiculous! Thank you for this post. Odd. I thought that we did. I was taught that the symbol of communion was important, but so long as my heart was in the right place, I could use milk and Oreo cookies. Are you telling me that my gluten-free communion wafers and grape juicy-juice are in violation of the Biblical symbol because they are not bread and wine? I’m not looking forward to spending days in the bathroom on account of gluten each and every week. Not all elements of the symbol are prescribed so there is some flexibility that doesn’t constitute changing. You can use cold water or warm/hot water in baptism. You can use gluten free bread or bread with gluten for the Lord’s Supper. Those aspects aren’t prescribed and don’t constitute changing. Having said that, if the Bible said to baptize in “cold water”, we wouldn’t have the liberty to use hot water. But since it doesn’t we’re free to use either. So I’m speaking of a willing change of substance not birthed out of necessity. I’m not speaking of changing specific elements within the prescribed symbol that is not detailed for us. Excellent, powerful article!! Thank you, Jeremy as always!